The Helicobacter-Pylori antigen rapid test kit (stool) is a rapid visual immunoassay for the qualitative detection of helicobacter pylori antigen in human stool specimens. This kit is used as an aid in the diagnosis of H. pylori infection. Helicobacter pylori (also known as Campylobacter pylori) as a spiral-shaped gram negative bacteria which infects the gastric mucosa. H. pylori to causes several gastro-enteric diseases such as non-ulcerous dyspepsia, gastric and duodenal ulcer, active gastritis and can even increase the risk of stomach adenocarcinoma. The epidemiologic study shows that more than 50% of the world's population is infected by H. pylori strains. Infection is more prevalent in developing countries. The lowest infection rate is 20%, and the highest infection rate can be 90% in developing countries. H. pylori strains is the major reason to cause chronic gastritis and gastric ulcers, 80%-90% chronic gastritis patients and 95%-100% gastric ulcers patients are infected by H. pylori strains. So the detection and treatment of H. pylori strains infection is very important. At present several invasive and non-invasive approaches are available to detect this infection state. Invasive methodologies require endoscopy of the gastric mucosa with histologic, cultural and urease investigation, which are expensive and require some time for diagnosis. Alternatively, non-invasive methods are available such as breath tests, which are extremely complicated and not highly selective, and classical ELISA and immunoblot assays. This Kit belongs to non-invasive approach. This kit is designed to detect helicobacter pylori through visual interpretation of the color development in the internal strip based on the specific The membrane was immobilized with antibodies-specific on the test well (T) and corresponding antibodies on the control well(C) . 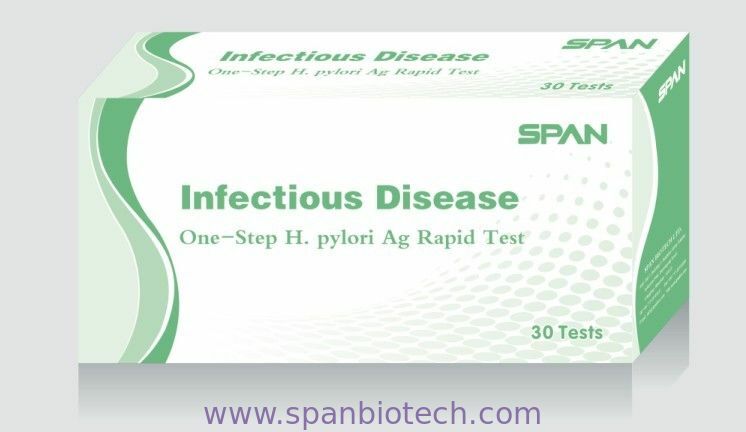 During testing, the specimen is added to the sample region (S) and reacts with anti-H. pylori antibodies conjugated to colored particles and precoated onto the sample pad of the test. Then, the mixture migrates through the membrane by capillary effect and interacts with reagents on the membrane. If there is sufficient H. pylori antigens in the specimen, a colored band will form at the test well (T) of the membrane, and this colored band indicates a positive result, while its absence indicates a negative result. A colored band at the control well(C) serves as a procedural control, indicating that the proper volume of specimen has been added and membrane wicking has occurred.